This mission disk one has a group of extremists in the Iranian army, backed by Libya and led by a power-hungry general, threatening to overthrow the moderate Iranian government. The Megafortress must defeat the rebels and put an end to Libya's ambitions in the Persian Gulf. Targets include terrorist training camps, bases, ports, and oil depots, weapons research and storage facilities. It includes 25 missions in the Iranian and Libyan theaters. 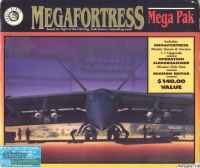 A compilation called Megafortress Megapak included the original game patched to version 1.1, the expansion pack Operation Sledgehammer, and a mission editor.